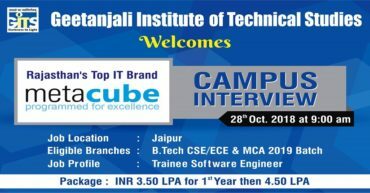 CAMPUS INTERVIEW OF METACUBE SOFTWARE PVT. LTD.
Campus Interview of MetaCube Software Pvt. Ltd. for the Profile of Trainee Software Engineer on 28 October 2018.